After several attempts to free himself from his master’s home due to the lack of food and water, this dog was stuck for several days and left unattended. He was found dehydrated and in need of urgent medical attention. 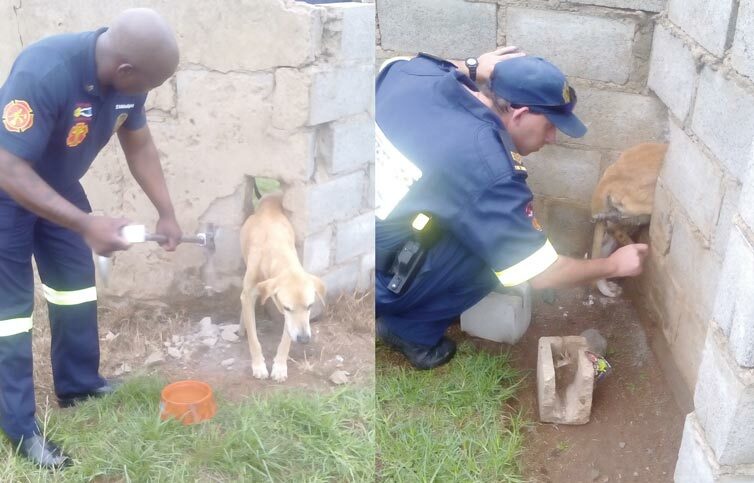 With the quick response of Anton Nortje and his team from the local firefighting department the dog was really relieved to be rescued. The owners of the dog was unavailable and he was removed and placed under the watchful care of Louis Fourie at the Rustplaas Animal Shelter. Due to the holiday, many pets were left unattended and some for days without water and food. The festive celebrations of fireworks not only left many animals homeless and lost but also placed our furry friends under stress and in shock. An urgent appeal is made to the public: Please make sure that your pets are accommodated for at all times and they have proper care even if you are not around to see to them. Louis Fourie adopted our rescued canine friend into the animal shelter but he notified us that the dog now named Kaptein had passed on due to the poor condition he was brought in with. The Rustplaas Animal Shelter houses more than 50 homeless dogs. Any members of public that are interested in placing the shelter under your charity wing can contact Louis Fourie on 082 373 8666 or Amanta Atchannah on 072 152 2386. Any form of donation will be used to accommodate the homeless animals. Die Rustplaas Dog Shelter sê baie dankie!